You may have heard it is impossible to digest swine manure. This is not true. Swine farmers can enjoy all the benefits provided by anaerobic digestion. They just have to work a little harder than other livestock producers to get them. The problem is hog farmers like to handle pig manure as a liquid. The extra water added to manure means digesters on swine farms are larger than those on other farms such as dairies. We can overcome this challenge by using specially designed digesters, scraping rather than flushing manure, or adding a high-energy co-digestion product to the waste stream. Outline the benefits of anaerobic digestion. Suggest methods for overcoming the handicaps with swine manure. Define terms used to describe digestion. Reduce odors and greenhouse gas emissions. Biogas is a mixture of methane (CH4 ), carbon dioxide (CO2 ), and a few minor (but not insignificant) gases such as hydrogen (H2 ), hydrogen sulfide (H2 S), and water vapor (H2 O). Both CH4 and CO2 are greenhouse gases. Releasing them into the atmosphere may contribute to global warming. Methane is a much stronger greenhouse gas than CO2 . Methane is also flammable. Burning CH4 does two things. First, it releases heat energy. Second, when CH4 burns, it forms CO2 and H2 O. Because the heat trapping ability of CO2 is much lower than CH4 , burning biogas lowers its greenhouse effect. Organic matter can be solid or liquid . Manure contains both: solid pieces of undigested food and intestinal bacteria, and soluble organic liquids. A digester reduces soluble organic matter from manure. Soluble organic matter is the main source of odors on hog farms. The digester also converts a large portion (around 50%) of organic solids to biogas. 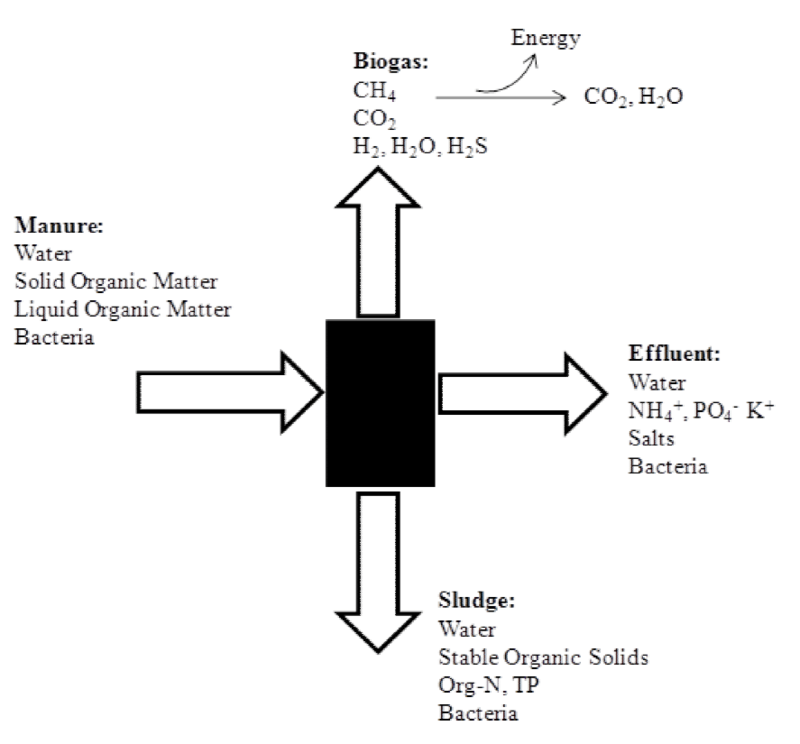 Sludge is the treated organic matter that settles to the bottom of a digester. The liquid stream, or effluent, flowing from a digester contains soluble nitrogen in the form of ammonium (NH4 +), soluble phosphorus (PO4 – ), and soluble potassium (K+). Effluent contains less organic matter than manure. It also contains salts and micronutrients. Soluble N, P, K, and micronutrients are valuable fertilizer. The trick is to use these nutrients while managing salt in the soil. Digesters come in many sizes and arrangements . All digesters are airtight. No oxygen (O2 ) can enter a digester, because oxygen kills methanogens. The reactor is also kept at the proper temperature and pH for the communities to digest organic matter efficiently. Hydraulic Retention Time (HRT): the length of time liquid remains in the digester. HRT is usually measured in days. 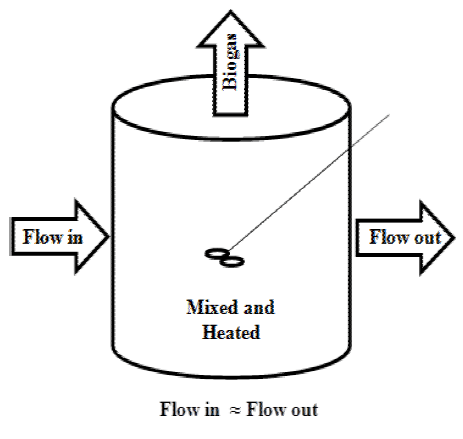 Solids Retention Time (SRT): the length of time solid particles stay in the digester. SRT is also measured in days. Volumetric Reactor Efficiency (VME): The volume of biogas (or CH4) produced each day, divided by the rector volume. Volumetric reactor efficiency is important to the farm’s bottom line. Remember, CH4 is energy. An inefficient digester may not produce enough energy to heat, mix, and pump manure. An inefficient reactor is an expensive treatment component. Specific Methane Yield (SMY): The volume of CH4 produced per mass of organic matter added to a digester. Volumetric Methane Yield (VMY): The volume of CH4 produced per volume of manure added to a digester. Pound for pound, the organic matter in pig manure produces just as much CH4as any other manure. Said another way, the specific methane yield of swine manure is high. Manure comes out of hogs wetter than it does from cattle, sheep, horses, and poultry . And since it is easy to move swine manure as a liquid, we add more water to remove it from buildings. Flush tanks, pull-plug pits, and power washers all add water to manure. The extra water means swine manure slurry has low VMY. 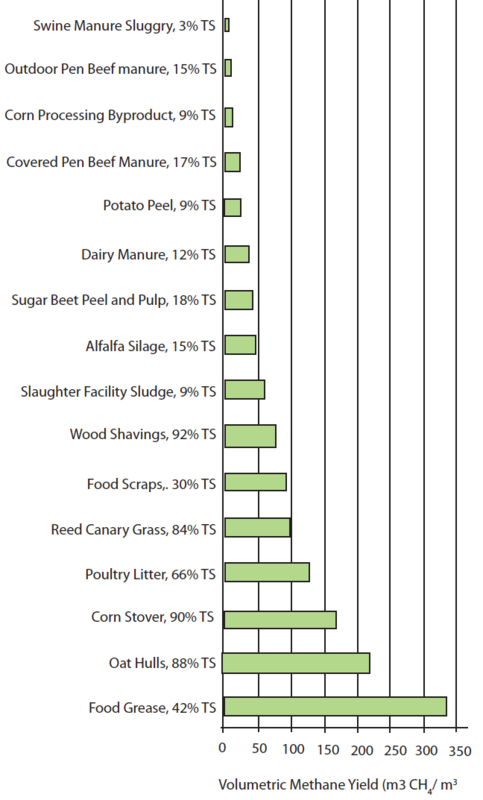 Figure 3 shows how the VMY of hog manure stacks up against other manures. Figure 3. Volumetric Methane Yield of Manures and Co-Digestion Products Measured at the Iowa State University Agricultural Waste Management Laboratory . Shorten HRT while keeping SRT long enough to sustain the microbial communities. This is what makes so-called high rate digesters “high rate” . Fixed film, Anaerobic Sequencing Batch Reactor (ASBR), and Upflow Anaerobic Sludge Blanket (UASB) digesters all work fine with dilute hog manure. They increase maintenance costs and require a fairly skilled operator, however. Add a co-digestion product with high volumetric methane yield to boost biogas production. The flip side to Figure 3 is if you add any of the materials lower on the chart than swine manure to a digester, you are guaranteed to increase gas production. A little caution is needed here. Each co-digestion product has a level at which it may become toxic to the reactor. Also, adding extra volume or solids to a digester may reduce HRT to unsustainable levels. Go simple and use a covered lagoon to produce and capture biogas. Covering the first cell of a twostage lagoon  will reduce most of the hassles, and gain some of the benefits of digestion. A lagoon needs more space than a mechanical digester, biogas production drops in winter, and much of the fertilizer value remains in the lagoon with sludge. But, if the main energy need is summer ventilation, and the farm is short on land to recycle nutrients, this may be the way to go. Hamilton DW. Anaerobic digestion of animal manure: Understanding the basic pro- cesses. Stillwater, OK: Oklahoma Cooperative Extension Service; 2009. OSU Factsheet BAE-1747. Hamilton DW. Anaerobic digestion of animal manures: Methane production poten- tial of waste materials. Stillwater, OK: Oklahoma Cooperative Extension Service; 2012. OSU Factsheet BAE 1762. Moody LB, Burns RT, Bishop G, Spajic R. Using biochemical methane potential as- says to aid in co-substrate selection for co-digestion. Applied Engineering in Agricul- ture. 2011; 27(3): 433-439.